Bromsgrove or ‘Bremesgrave’ as is it called in the Domesday Book, is steeped in history. There has been continuity of Catholic worship in Bromsgrove since Anglo-Saxon days. In 653 AD Peada ruled the area of the Middle Angles in Mercia. Wishing to marry Alchfleda, daughter of King Oswy of Northumbria, Peada accepted the Christian faith and was baptised, such being Oswy’s condition for sanctioning the marriage. Until the Reformation and the Church in England’s break with Rome the faithful worshipped in St John’s Church. This church has its Norman origins in the 12th century. In the 13th century the chancel was rebuilt. The building of the embattled parapet tower and spire was probably interrupted by the Black Death (1349) and not resumed until after 1400. After the Reformation Catholics worshipped in secret at Grafton Manor. This country house and much land besides had been given to Gilbert Talbot of Shrewsbury by Henry VII for his support against Richard III at the Battle of Bosworth (1485). The persecution of the Catholics during the period of the Tudors and Stuarts was very severe. The faith survived due to local Catholic nobility who owned a cluster of houses in the vicinity: Grafton Manor, Huddington Court, Coughton Court, Hindlip House, Badgecourt, Harvington Hall and Hewell Grange. These houses made up a map of secret Mass centres. Some of them later became embroiled in the Gunpowder Plot (1605). It is impossible to sketch a full picture of what life was like for our Catholic ancestors in those dangerous times. Constant alarms, suspense, mental anxiety was the lot of many for years. Visitations and searches by priest hunters, information lodged in secret, frequent attendance at meetings with magistrates for cross-examination, detention in prison, confinement to the precincts of one’s own house or estate; privation, destitution and ruin caused by the enactment of fines for refusing to conform to the new ways. No one was safe; few could be trusted. After 1570 for more than twenty years John Talbot of Grafton Manor was increasingly harassed by fines and imprisonment. He was finally allowed to return to Grafton where he died in 1610 worn out by his troubles. His son, George, succeeded him to a much diminished estate but in 1617 he inherited lands and title to become IX Earl of Shrewsbury. Throughout this time Jesuit priests with their controlling centre at Hindlip House governed all the Mass centres in north Worcestershire including Grafton. At least four English martyrs were captured at Hindlip House – the priests Ralph Ashley, Henry Garnet, Edward Oldcorne and the lay brother Nicholas Owen, the hiding hole constructor. In 1678 the last but very savage persecution followed the Titus Oates campaign to implicate Catholics in an alleged plot to assassinate King Charles II. It was at this time that the Franciscan priest St John Wall was captured at Rushock, west of Bromsgrove, and executed at Redhill, Worcester on 22nd August 1679. A religious census of 1676 records that there were 727 Catholics in the Worcester Diocese. The figures for our own area list: Bromsgrove 25, Tardebigge 37, Stoke Prior 7, Elmbridge 12, Hanbury 2 and Rushock 5. In 1689 the Toleration Act granted freedom of worship to dissenters from the Church of England. Catholics were not included in this amnesty, but the time of persecution was over. In 1710 the chapel and a major part of Grafton Manor was destroyed by fire; only the west wing remained habitable. Around this time probably as a result of the fire, Grafton ceased to be the official residence of the earls of Shrewsbury. The Second Catholic Relief Act of 1791 allowed Catholics to have public places of worship. In 1796 Fr Andrew Robinson put a roof on the derelict Grafton chapel and registered it for Catholic worship at the Worcester Michaelmas Quarter Sessions (4th and 5th October). Some idea of the size of the parish can be gleaned from there being 154 Easter Communions in 1807. In the same year Bishop John Milner, Vicar Apostolic of the Midland District (1803-1826) confirmed 64 candidates. When the Shrewsbury Earldom passed from Catholic hands the parish’s days at Grafton were numbered. Fr Henry Campbell, whose body is buried in St Peter’s churchyard, was the last priest to serve at Grafton. He lived through the Catholic Emancipation Act (1829) and the restoration of the hierarchy in England and Wales (1850). He also witnessed the transfer of the parish base from Grafton to the present site of St Peter’s. In 1853 a parishioner William Stott gave the property of Grove Farm to Bishop William Ullathorne (first Catholic Bishop of Birmingham). When it was decided to build a church on the property William Stott gave £2000 and his sister, Elizabeth, gave a further £300. Father William Cunningham was the first Parish Priest. The building was built between 1859 and 1861. The architect was Gilbert Blount of London who designed and supervised the Gothic revival erection. James Wilson and Co. of Birmingham were the building contractors and the slate roof contract was sub-let to the local Jonathan Brazier. St Peter was an appropriate name for the church as it was situated on Rock Hill. A more probable explanation lies in the origin of the high altar which is of exquisite beauty. It was built by the architect Augustus Welby Pugin for John Talbot XVI Earl of Shrewsbury for the chapel of St Peter at Alton Towers in North Staffordshire. The altar was made up of numerous artefacts rescued by Pugin from the continent following the vandalous destruction of the French Revolution. The altar contains portraits of the Earl and his Countess Maria Theresa at prayer. At the time the Earl was one of the greatest patrons of the church in England and especially the Midlands. He was known affectionately as the ‘good Earl John’. The altar has stood in St Peter’s since 1860 when the church was used for religious worship. The church was officially blessed and opened by Bishop Ullathorne on 24th September 1862. Doubtless, the church and altar were admired by Mabel Tolkien, the mother of the writer, J.R.R. Tolkien. Mabel attended St Peter’s while residing at Rednal and when she died on 14th November 1904 her body was buried in the churchyard. It was in 1904 that Father Clement Haskew was appointed as Parish Priest. He made his first priority having the altar and church consecrated. Bishop Edward Ilsley officiated at the consecration ceremony on 29th September 1910, a ceremony celebrated by the parish 100 years later. A notable visitor who regularly worshipped at St Peter’s was Sir Edward Elgar. 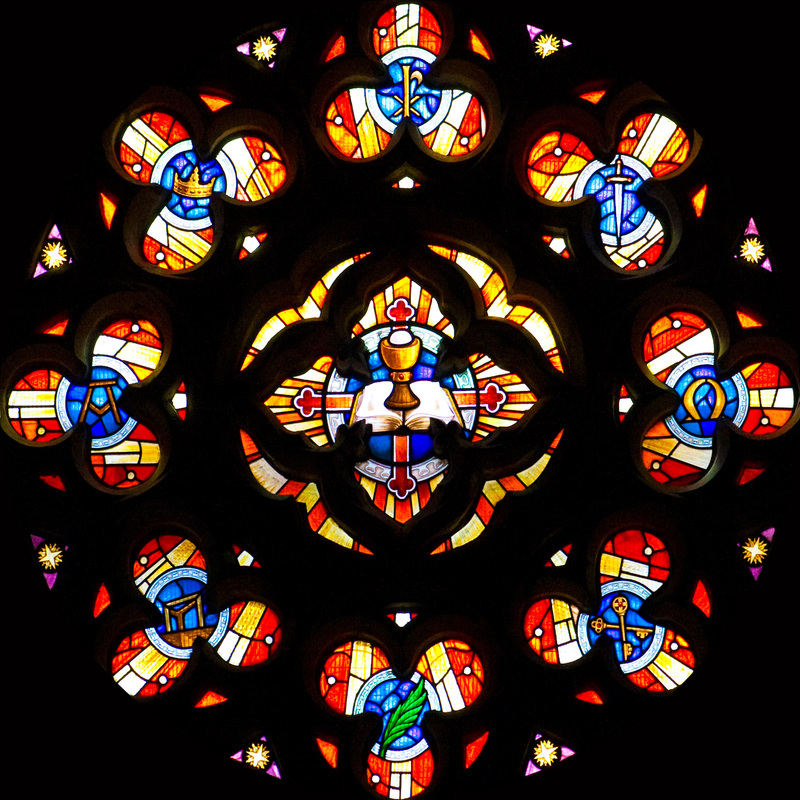 The parish celebrated the 150th anniversary of the building of the church in 2008 with the insertion of the Martyrs Rose Window in the West end of the Church.